While up significantly this week, Viacom's strong content library and low valuation mean it still has room to run. Despite Viacom's VIAB recent increase of about 15% due to positive news flow and rumors about merger talks with CBS Corporation ( CBS - Get Report) , the stock price of the media conglomerate has been declining over the last several years. The class B share price, at about $29, amounts to one-third its peak level reached during 2014. The price reflects the concerns around the short-term issues and the long-term challenges of the core business. The Media Networks segment, which drives most of its revenue from advertising and distribution of content to legacy cable and satellite television providers, still represented 77% of Viacom's total revenue in 2018. The Film Entertainment segment, which develops and distributes films and television programming content, generated the rest of the revenue. The market is worried about the impact of the cord-cutting momentum for the Media Networks business. With the evolution of video consumption, there's regularly news bringing some concern over Viacom's legacy business. For instance, there was an intense negotiation before renewing the contract with AT&T ( T - Get Report) to keep offering Viacom channels on DirecTV. Also, with the announcement of the entry of Apple into the TV streaming business, Viacom will be facing an extra strong competitor. The cord-cutting momentum is real. The legacy cable television channels, like Disney's ( DIS - Get Report) ESPN, reported declining subscribers over the last several quarters. This trend impacts Viacom in two ways. A reduced audience will penalize the revenue from the advertising business. It will also weaken Viacom's leverage to negotiate with giant content distributors like AT&T. But management is taking steps to mitigate this secular decline. The company is diversifying the distribution of its content through online services such as Alphabet's ( GOOGL - Get Report) YouTube and Instagram. And with the recent acquisition of PlutoTV, Viacom is entering into the streaming TV business via a direct-to-consumer offering. The $340-million acquisition allows Viacom to reach Pluto's 12 million MAUs (Monthly Active Users) to leverage its library and its advertising activity. Also, the company signed agreements to deliver exclusive content to over-the-top pure players. Over the new few months, the streaming TV offerings will become crowded with Netflix ( NFLX - Get Report) , Amazon ( AMZN - Get Report) Prime Video, Disney+, ESPN+, Apple ( AAPL - Get Report) TV+, Facebook ( FB - Get Report) Watch, etc. The giant companies proposing these models are hungry for original content to grow and keep the subscribers. And Viacom owns this type of content via a library that includes MTV, Comedy Central, Nickelodeon, etc. Also, Paramount Pictures owns worldwide famous franchises like Mission: Impossible, Star Trek, and Transformers. Thus, an acquisition by a large content provider eager to enrich its offering would make sense. But Viacom and CBS Corporation are both controlled by Sumner Redstone through National Amusements. Thus, the chances for a merger with CBS are much higher before deals with bigger players take place. The reports of renewed merger talks with CBS confirm this possibility. Besides the operational aspects, the current market valuation is another reason for the stock price to increase. 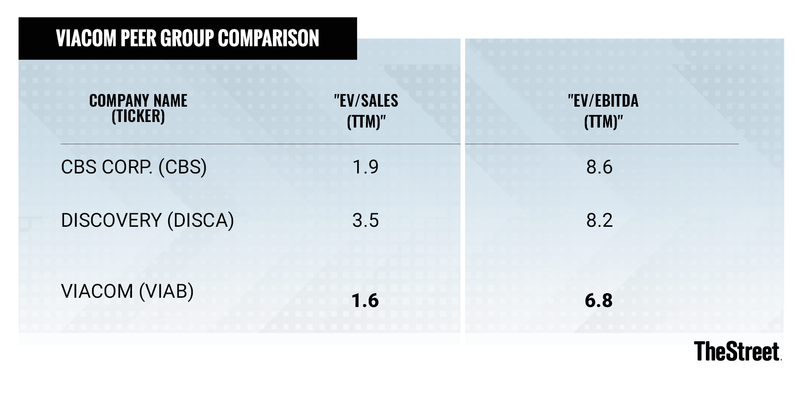 Compared with its peers, the market values Viacom at a discount from the EV/Sales and EV/EBITDA ratios perspective. Since 2016, the revenue and the operating income have been stagnating at about $13 billion and $2.8 billion, respectively. The PE ratio, based on trailing earnings, amounts to about 7.5, which corresponds to an earnings yield of 13.3%. The company only needs to keep earnings flat to justify an attractive value proposition at the current stock price of about $29. But on a constant currency basis, the revenue and the adjusted diluted EPS actually increased by 4% and 13% during the latest reported quarter. The balance sheet also improved. The net debt decreased by about $4.2 billion over the last 2 years to reach approximately $8.4 billion. The threat of the declining legacy core business is real. But with such a low valuation and with the potential to take advantage of the strong content library, the possibilities for Viacom's stock price to increase are important. Apple, Amazon, Alphabet, Disney and Facebook are holdings in Jim Cramer's Action Alerts PLUS Charitable Trust Portfolio. Want to be alerted before Cramer buys or sells these stocks? Learn more now.